Customs Officer, Fred Peacock, lived in Dovercourt; his mother lodge was Comrades L.2976 and became a joining member of EUSL on the 2nd June 1926. The Comrades Lodge centennial history, published 2003, advises that its petition was sponsored by Angel L.51, ‘to meet the needs of servicemen in this garrison town’. There are two entries pertaining to the inter-visitation between Comrades and EUSL. The Lodge called off and on resuming from refreshment to labour the ceremony of the 3rd Degree was completed by W.M. [Len Scales] who worked the whole degree in a most credible manner and to the satisfaction of all brethren assembled. The Lodge was immediately lowered by gavel to the 1st Degree whereupon the WM welcomed on behalf of the Lodge the Brethren of Comrades L.2976 Colchester who had made a mass visit as guest of the W.M. Replying to the WM, W.Bro. Peacock P.M. PProvGStdB thanked him on behalf of all visitors present and suggested that a return visit to the Comrades Lodge should be made in mass by as many of the Brethren as could get away and extended a hearty invitation to all of L.3804. At the March meeting WM Scales, referring to the invitation from Comrades ‘expressed the hope that as many as could would take advantage of the occasion’. Thereafter, followed a pattern of the most fraternal annual exchanges, ‘visits in strength in goodly numbers’, until WWII. For the duration of which, Harwich was requisitioned and made a restricted area with the issue of IDs, passes for residents and a serious interrogation of would-be visitors. At the March 1952 meeting, a letter was received from Comrades regretting the inability of any of their members to attend. A month later there was an invitation to the Lodge for an en bloc visit to Comrades. And, repeated in the following May with a gift of £10 for the Lodge Restoration Fund. The minutes of the meeting held on the 6th March 1957 state that, ‘the Secretary read an invitation from Comrades Lodge for the members of this Lodge to visit them on 16th March. However, there is no record of this taking place or a reciprocal invitation. The next mention of a similar invitation was 19th March 1962 and in the minutes of the May meeting, was a welcome to the Master and Members of Comrades Lodge on this, ‘their official visit to the Lodge’. It does not state if it was for officers only but at the April 1966 meeting an invitation was read inviting the WM and Officers. 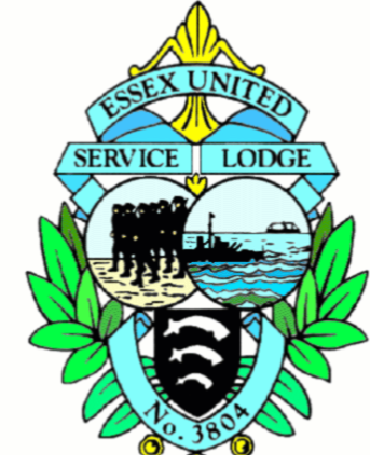 The minutes are imprecise thereafter, but at the May 1975 meeting, in Open Lodge, it was agreed that all Comrades, not just officers, should be invited to the June meeting. This was most generous as in the previous month, owing to the reconstruction works at the Colchester Centre, only one EUSL member was allowed to attend the Comrades meeting: for which, Frank Herbert was selected. It seems that he inter-visiting was celebrated musically – a song sheet was found in the EUSL Minutes Book – perhaps there should be plans for reviving its performance? When the Comrades visited in June 1982, Secretary McManus advised the meeting that he was the only Lodge member remaining who was present at their first visit in February 1932. It was not uncommon to mark in the Lodge its regret at the call to higher service of a Comrades member, Also, on their visit, it was customary for the Comrades WM to present the Working Tools. All credit and acknowledgement to Bro. Gerald Reilly EUSL3804. Taken from his book “United in Service – Forever and Aye”, written to commemorate the EUSL Centenary.